Varsity is a locally owned and family operated company. We offer premier Chandler pest control services from our family to yours. We understand how important the health and safety of your family is to you, and taking care of pests efficiently is a big part of this. Here at Varsity we are proud of the superior customer service we offer to all of our clients and the great reviews we get in return. We have top ratings on Google+, Yelp, the BBB, and Home Advisor. We treat each and every client with the same care and respect. Our team of local exterminators works hard to provide honest and quality service. Because Chandler residents and business owners are dealing with a variety of different pest problems, Varsity offers the best comprehensive extermination services around. No matter if you are dealing with ants, mice, roof rats, spiders, bees, bed bugs, pigeons or any other type of pest, we can help. Our technicians have all been expertly trained and are certified by the State of Arizona to perform the services we offer. We are so confident of the services we offer that we back them with our Premium Services Guarantee. Honest pest control service that works- that’s the Varsity promise to you. Chandler, AZ is a great place to work, live, and visit. Its proximity to Phoenix attracts many new residents every year, because it is ideal for commuters and their families. Chandler has a great climate, lots of things to do and experience such as top rated shopping, fine dining, top golf courses and much more. But none of this is truly fun, if you are dealing with a pest problem. Sadly, the Arizona climate is not only popular with humans, but with pests as well. If you suspect that any kind of pest has invaded your living space, you should contact a professional Chandler pest control company as soon as possible. 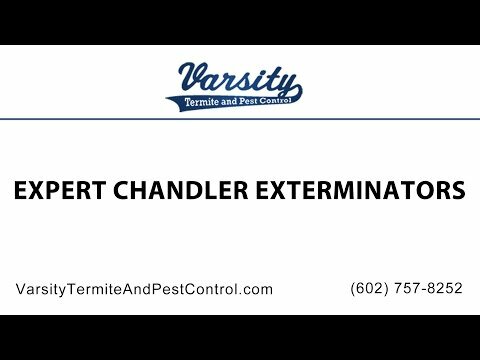 Varsity Termite and Pest Control has been providing stellar pest control services in the Chandler area for many years. Our thorough understanding of the life cycle of the pests we are dealing with along with our methodical and proven approach, has made us one of the most successful pest control companies in the entire valley. We understand how bothersome and how expensive a pest invasion can be, which is why our friendly and experienced home pest control professionals will take care of your pest problem fast! Termites are a pest that can be extremely hard to get rid of. Our Chandler termite control technicians have years of experience in the field and in efficiently ridding homes and businesses of those pesky little creatures. When dealing with scorpions it is of the essence that you find a local pest control expert who has extensive experience in Chandler scorpion control, because they usually do not respond to general pest elimination methods, but require different methods and strategies. With up to date and proven methods, we help our clients to get rid of those nuisances and prevent them from coming back. Varsity Termite and Pest Control is the pest control company in Chandler that has the fastest response time to deal with different kind of pests that can frustrate your family, pets, and even damage to your house. Don’t hesitate to contact us for more information about what we offer. Termites are little creatures that can live in dark places between your walls or under your floor and backyard. Since they feed on furniture and support beams made out of wood, as soon as you see any signs of termites, you should contact a pest control company like Varsity Termite and Pest Control right away. Scorpions have a stinger on their tails that they use to defend against enemies or attack their prey. Their sting can cause skin issues to your family and pets, so you should contact a professional pest control company as soon as you find one of these little creatures in your house. When hiring a local home pest control expert for your Chandler pest infestation it is essential that you work with someone you can trust. Varsity has decades of experience, stellar ratings and a great success rate. Our fast and friendly technicians can inspect your home for visible and invisible signs of pests and develop an individualized treatment plant that targets the specific problem at hand. We proudly offer free termite inspections and our technicians are Termidor certified. We are so proud of our services that any and all services performed carry our warranty. As your local Chandler pest control contractor, we have intimate knowledge of regional pest problems, because we are dealing with them too. We are here for you and want to help to keep your family as safe as we are keeping ours. Q: Do I Need Professional Help for a Roach Infestation? A: Yes! Roaches have been around forever and that shows just how hard they are to eradicate. Most common pest control methods do not work on cockroaches, which is why a professional cockroach exterminator is required. Only an experienced pest control professional can ensure that the roaches are controlled properly and give you tips on how to prevent them from coming back. Q: Should I Contact Arizona Pest Control for a Cockroach Problem? A: The answer is undoubtedly yes. Whether you need pest control in Chandler, AZ, or any other community in the area, cockroach infestations are best left for professionals to handle. Cockroaches are especially difficult to get rid of once they’ve decided to enter your home. Your Chandler cockroach experts can evaluate the extent of the infestation and devise the best strategy of how to address the particular problem. Contact us as soon as you suspect you are dealing with a cockroach problem. Q: Which Cockroach Species Do Arizona Pest Control Companies Usually Deal with? A: The German cockroach and the brown banded cockroach are the species most commonly dealt with. This is because these are the two species which are most likely to be found inside of homes. The brown banded roach is often found in offices, as they like to eat starch found in envelope glues as well as other paper products. The German cockroach is usually found in kitchens and bathrooms. Both of these species are particularly resistant to extermination measures. Q: How can I avoid needing pest control in Chandler, AZ for cockroach problems? Get rid of clutter, especially paper and cardboard. Getting rid of clutter eliminates possible hiding spots. Some species like the brown banded cockroach enjoy eating paper and cardboard and may view cardboard boxes as an invitation to move it. Removing what they love is a major step in pest prevention. Keep food in sealed containers. The German cockroach loves food. If you eliminate food sources by placing open foods in the refrigerator or sealed plastic bags and airtight bins, you greatly minimize the attraction for the roaches to spend time in your home and kitchen. Keep your kitchen clean, in particular the corners and under and behind appliances. Cockroaches will find what you missed. That’s a fact. Give your kitchen a thorough wipe down once a day to ensure that there are no hidden crumbs or food trails that may be enticing to those pesky little creatures. Sanitize regularly. Sanitizing not only gets rid of the scent of food, but also of potentially pathogens stemming from infected roaches crawling over your kitchen counter. The cleaner it is, the less likely they will be to return. Unfortunately, even the cleanest of spaces can contract a roach problem. Q: Are Arizona cockroaches dangerous? A: In a nutshell, yes. Cockroaches can carry diseases which may be passed on to humans through infected foods. They can ruin books and wallpaper by feeding on the paper, and increase asthma symptoms in those who are sensitive. Pest control in Chandler, AZ should always be contacted to deal with any roach infestation. If your home is being taken over by roaches, don’t hesitate to contact Varsity. We provide pest control in Chandler and all areas throughout the Valley. Cockroaches are notoriously difficult to deal with and should always be taken care of by a professional. Contact us at 602-757-8252 for a free inspection and evaluation. Are DIY Cockroach Remedies Really Working? Read the rest of Are DIY Cockroach Remedies Really Working?